Should in-house lawyers allow their internal clients, the business managers, to micro-manage the law department budget? Should business people be allowed to help select outside counsel, to sit in on transaction or litigation updates with outside counsel, or even to attend trials or participate in negotiating sessions that are beyond business issues and deep into legalease? Moreover, should business managers be allowed to interact directly with outside counsel, bypassing the in-house lawyer completely? Many in-house lawyers say no. The in-house lawyer's job is to run point on these legal tasks, filter the issues and then provide wise counsel to business management, they say. There is often an unstated belief that many of the legal issues are slightly beyond the grasp of most business managers. Does this attitude change if the in-house law department allocates its costs via charge-back to the internal clients of its services, making business managers the more direct buyers of legal services? 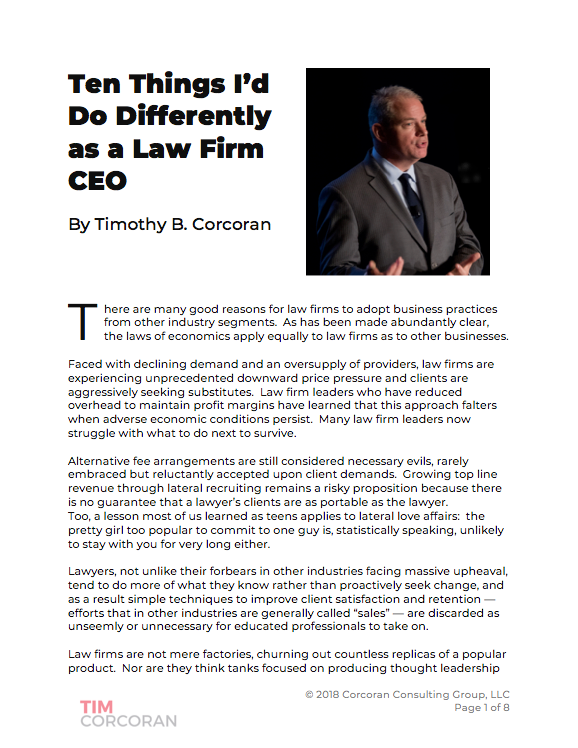 "One reason for such reluctance is a fear that clients will then believe they have a right to say which law firm to use and how to manage the firm, to meddle in the management of cases, to pick and choose which associates and partners, as if even to sit second seat at trials." In my various roles in business management, I've had the opportunity to retain outside counsel for a variety of projects. I've also had stewardship over the in-house law department (also called, alternatively, the "Department of No" and the "cost center"). In not one case did I or my colleagues in the executive management ranks feel overburdened by the legal issues. We felt pretty confident that we could grasp the nuances, though our objective was determinedly fixed on how these legal issues aided or impaired our ability to accomplish the business objectives. Indeed, there might be something to gain if the legal department were to take some cues from its internal clients. In many businesses we are required to estimate revenues and costs well in advance -- in a typical planning cycle we submit our budgets by August for the following year. And there is no easy forgiveness if we fail to properly predict the future. You can surely imagine the challenge in quantifying uncertainty in a businesses own production capacity, market demand, competitive threats, economic or regulatory or other exogenous influences. When allocating capital expenditures or targeting acquisitions, we must calculate cash flows 5 to 7 years out. So when the legal department submits a budget that adds a 20% premium over last year, intended to address likely outside counsel rate increases and to provide sufficient cover for an unknown number of transactions and unforeseen litigation, you can imagine our skepticism. Without question it's a challenge to predict legal costs in the face of uncertainty. But this isn't a binary situation, where you either can or cannot provide useful estimates. Not everything is uncertain to the same degree. Divide and conquer. For recurring legal work, there is a greater chance of predicting variability. For others, such as litigation which is often a lagging indicator, look to leading indicators. Is there a significant share price drop this year that will likely lead to shareholder action next year? Do your internal compliance metrics suggest a potential whistleblower or FCPA claim? How about the rate of defective returns this year, is there a chance of a products liability suit next year? You get the picture. As for outside counsel selection, we've all heard about the fear of hiring the "wrong" firm even at the right cost, because when the deal goes south the in-house lawyer will be held responsible. In reality, I've been in numerous transactions and negotiations and rarely have I felt our position to be so tenuous that success or failure is primarily going to be influenced by the quality of our advocacy. Furthermore, with all due respect to in-house counsel, if your own contribution is deemed to be so tenuous that your retention is tied primarily to the proper selection of outside counsel, then perhaps there are other issues in play. And finally, I'm confident that even where these fears are valid, allowing business management to participate in the selection process will diffuse the responsibility for a poor selection. What do you know of our business challenges? How would you approach working through these business challenges with us? What will you charge for these services? If your rate is substantially higher than other firms, please quantify how your approach is substantially better. Most business executives are approached by an endless parade of suitors who wish to sell us something, partner with us, forge an alliance or joint venture, use our sales channels to sell their products, use our capital to grow their business, and so on. We get pretty good at quickly ferreting out the pretenders and for the remainder we focus on how their contribution is additive to the business. If they've done their homework, they can help write this storyline. As the legal marketplace evolves, and as law departments are tasked with <gasp!> bringing their expenditures in alignment with the fiscal controls used elsewhere, and with the emergence of multiple alternatives to the "classic" way of delivering legal services, it's incumbent on in-house lawyers to move along the continuum from lawyer to business leader. There are a number of approaches in use in every business today which can improve the budgeting and management of the legal function, including the selection of outside counsel. When we in the business ranks meddle, it's because funds inefficiently diverted to the legal function create an opportunity cost elsewhere. Let us behind the curtain, because we might have something to add. And what's the worst outcome? Perhaps after a day of sitting through law firm presentations we'll end up like the young teenager whose parents provided her first cigarette. While choking and turning blue, she exclaimed, "What a stupid idea. I won't try that again."